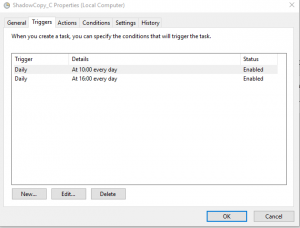 Configure Shadow Copy For Windows 10 – It`s simple when you know how ! Windows 10 lack the feature of schedule shadow copy like in windows 7 and server 2008. But you Still can do it with Win32_ShadowCopy class in WMI. Previous: The Microsoft Exchange Transport service is rejecting message submissions because the available disk space has dropped below the configured threshold. Just wanted to say THANK YOU for this great post! 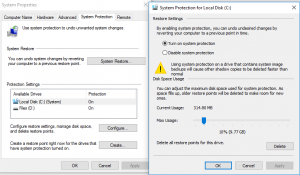 This problem was driving me nuts and I couldn’t find a practical solution to reenable those snapshots in Windows 10. This is so simple yet beautiful – oddly though nowhere described on the whole internet. Thank you! This was a huge help. Like the Alex said, I could not find this described anywhere else. good article… work for me. This procedure was working for me in Windows 8 (file recuperation via localhost folder instead of menu tab). In Windows 10 however, the back-upped files aren’t visible anywhere.